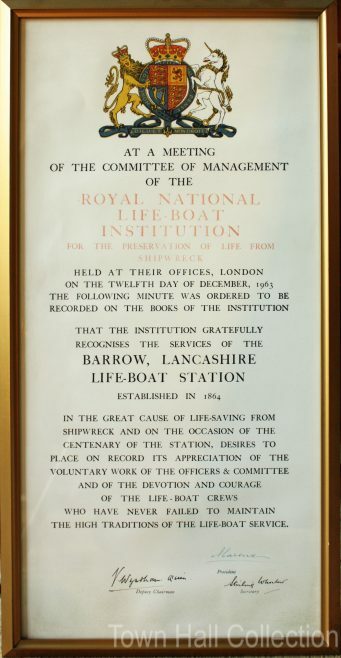 Certificate produced by the RNLB recognising one hundred years of the devotion and courage of the crew of Barrow’s lifeboat station at Roa Island. The text reads: “The institution gratefully recognises the services of Barrow, Lancashire Lifeboat Station established in 1864 in the great cause of lifesaving from shipwreck and the occasion of the centenary of the station, desires to place on record its appreciation of the voluntary work of the officers and committee and the devotion and courage of the lifeboat crews who have never failed to maintain the high traditions of the lifeboat service.” In 1963 Herbert Leigh was Barrow’s lifeboat and she is now in the museum’s collection. Former accession number of the certificate: BAWFM.06010.2.